adapted for a gate fold. As I was coloring this adorable Bugaboo Stamps image with ProMarkers, I thought it would be fun to do a gate fold card since I hadn't done one in who-knows-how-long! I added a bit of sparkle gel ink to the raindrops which you might be able to see if you enlarge the photo. I used a die from Spellbinders to cut the image, then inked the edges with a ProMarker. I made the gate fold and added more score lines to each side for a bit of texture and visual interest. The dp was in my scrap basket and I trimmed each scrap to size for the front of the card. I printed the sentiment onto a scrap of white CS, then hand cut it before adding it. The final touch was one of my hand-sewn, signature bows, and I dyed it with the same ProMarker as I had used to ink the edges of the image. Great idea about saluting the rain gods. Love your cute and fun card that does just that too. FUN image! We're praying for rain about here and they keep saying we could get a few drops this weekend maybe. Hope they're right! The Gods must hear you with this card, LOVE it. fun and pretty too. I hope the rain Gods heard you, we were lucky to have rain overnight, and another beautiful day here. Such a nice change LOL. 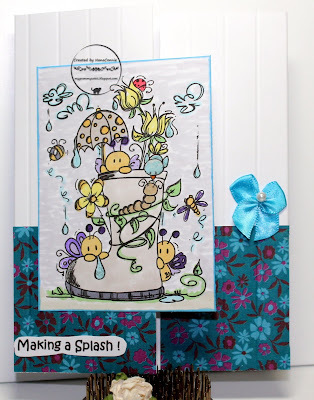 A really super image and so pretty in all the soft pastels, thank you so much for sharing it with us at Stamping Sensations June challenge. This is so cute and I love your colour scheme. Thanks for joining us at Stamping Sensations. This is such an adorable image! I love the boot filled with all the crawling critters! Great card, and great take on the challenge. Thanks for joining us at Catch the Bug. Love these color choices. The embossed lines add a great detail and the paper is so striking. Such a fun card - great colouring and a super image as well. Hope you get the rain you need! Your card is adorable. Love the bright colors. Thanks for joining in the Stella Says Sketch challenge, Lisa Lynn DT. On Top of the World !